Fitness Reality 810XLT Super Max Power Cage. A power cage (or power rack) is the backbone for any home gym. This piece of equipment will allow you the versatility to perform some of the most effective workouts there are. With the addition of just a weight bench and a barbell and weight set, you can perform everything from squats to bench press to cleans and so much more. 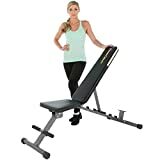 This in an incredibly sturdy piece of equipment, easy to put together, and will become your go to for getting that workout in to make you feel great. Fitness Reality 1000 Super Max Weight Bench. A weight bench is a must have in order to perform certain workouts such as bench press or incline press. This bench supports up to 800 pounds and features 12 backrest angles. It is also very easy to fold up and store when trying to save space. 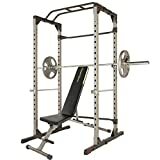 FYI, if you plan on getting a Power Cage as well, the Fitness Reality 801XLT Super Max Power Cage has an option to include this bench for $20 cheaper. 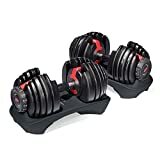 Bowflex Selecttech 552 Adjustable Dumbbells (Pair). It took a long time before I finally splurged on a pair of the dumbbells and I am so happy I finally got them. Each dumbbell can easily adjust from 5 to 52.5.5 pounds with its dial system so that you can perform virtually any dumbbell related exercise with just these two units. 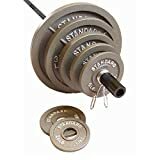 These are a great space saver and really allow you to perform more than just your basic dumbbell curls. Cap Barbell Olympic Weight Plates Sets. A barbell and weight set is a power rack’s best friend. This set comes with the bar, the weights and the spring clip collars. Once these are dropped off at your home you will be doing bench press and squats in no time. A kettlebell is one of the most versatile pieces of workout equipment you can own. Upper body, lower body, core, there are exercised than target every part of your body with this one item. These kettlebells feature high quality solid cast-iron construction as well as a painted exterior to provide extra durability as well as protection against corrosion. Prosource Puzzle Exercise Mat, Eva Foam Interlocking Tiles. This is the one item my wife actually demands that I have. I am an early riser so I typically go workout in our garage before our kids are awake. The last thing I want is the loud clanging of the weights on our concrete garage floor to wake up our children. These floor tiles allow for me to reduce the sound coming from me throwing around weights as well as protect both the floor and the exercise equipment from damage. Keto Conduct is a participant in the Amazon Services LLC Associates Program, an affiliate advertising program designed to provide a means for sites to earn advertising fees by advertising and linking to amazon.com and affiliated sites. Copyright 2019 Keto Conduct. All rights reserved.